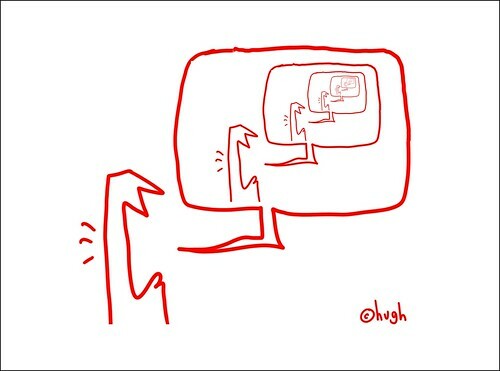 Echo Chamber by Hugh MacLeod It was probably one of the scariest things I had ever done in my blogging lifetime, but it was probably about eight to ten months ago or so that I stopped 'chiming into the discussion'. One day I woke up and realized that I wasn't adding much more to the conversation. I could still scan Techmeme and Tailrank to find out what people were talking about, but it was about time that I actually start creating solid content of my own. I could look back and pull more 'articles' out to reference what I am working on and really believe in. Not 'me-toos' and 'not-mes'. By creating my own content, and only adding to other conversations when I really really really have something to add, I make much more intelligent additions to the blogosphere. I was getting bored of my own blog. Of course, though, the downside was pretty scary. 'Joining the conversation' was what got me many of my readers in the first place. As Guy pointed out at some point, reading Techmeme, then linking to all of the bloggers who are talking about a subject and adding a bit is good for the stats. It's definitely a 'trick'. So is controversy. It's like traditional advertising and PR...sure, it works...while you pay for it. While the pressure is on, you will get results. Spend more, you'll get more. Usually 1% of 10% of the people who see your ad or read your addition to the techmeme news item will buy. But will they stay? Not if you don't provide interesting commentary. What I found is that, although my traffic and Alexa rank all dropped pretty drastically at first, I slowly started climbing again. Technorati is still dropping, but that 'rank' is directly related to Echo Chamber Activity (ECA) - links links links. And this time I was actually being read. At one point, I asked my readers to switch their feeds from the Blogger atom feed to my Feedburner feed (as I knew I wanted to make the transition over to Wordpress). Guess how many people responded and changed...40 on Bloglines out of 500 and I didn't even track any of the other feed reader stats (my rough webstats indicate that I have about 4,000 people on my atom feed versus my Feedburner feed of 1,500). A pretty clear indication of who ACTUALLY reads me versus who just popped me in their feed reader one day and forgot that I was there. I'm pretty certain that stats mean only about 1/4 of the picture for any blogger, though. The difference, for me, was in how people were responding to my posts in my comments that really convinced me that I was going in the right direction. My average number of comments went from about 2 or 3 to around 10. People were engaged! Interested! Angry! Inspired! They read and they felt and they responded. This was the big pay off for me. My relationships with my little HorsePigCow community were getting deeper and more interesting. Hell, I could think I was talking to 10,000 people per day and end up talking to 1,500 OR I could know I was just talking to 1,500. It was a pretty enlightening (and empowering) experience. And...it made it easier for me to 'let go' and make the transition over to Wordpress. If people really wanted to continue reading me, they would follow. Stats mean nothing if they don't account for real people who are truly interested.